Discover sacred sites and scenic spots and pay homage to Japan’s greatest saint on Shikoku’s historic pilgrimage trail. Kukai was a Buddhist monk who lived in the 9th century and is considered one of Japan’s greatest Saints. His mausoleum and monastery on Mount Koya in Wakayama Prefecture are visited by millions each year. Many also come to Shikoku year after year to pay homage to ‘O-Daishi-san,’ visiting sacred sites where Kukai trained as a monk and spent time during this life. They come for many reasons: to receive the monk’s blessings, in memory of someone who has passed away, for healing and reflection, or for self-discovery. Of course, outdoorsy travelers to Japan are also drawn to Shikoku’s 88-Temple Pilgrimage. The temples are numbered, and pilgrims usually follow the route clockwise through the four prefectures of Tokushima, Kochi, Ehime, and Kagawa. Walking this trail is a serious exercise but what counts more is the cultivation of your mind. Each prefecture is considered to be a Buddhist dojo (a place for training) to progress on your path to enlightenment, or at least to become a better person. It would take a month and a half on foot to complete the whole circuit. As this is a long time away from home, and a lot of time to take off work, as well as a considerable expense, the majority of pilgrims conduct the pilgrimage in stages. If you have 10 days and a budget of ¥150,000, you can manage a third of the route. Of course, it can be done in smaller steps. The traditional way is to walk, but nowadays, it is perfectly okay to cover long stretches of the trail by local bus, highway bus, or train. Doing it this way makes daily walking distances a manageable 10 to 20 km. Your first call of action is to select the temples that you would like to visit and then connect their locations by public transport. Then you will have your rough itinerary. Temples 1 to 6 and 11 to 12 in Tokushima Prefecture, temples 24 to 26 and 31 to 33 in Kochi Prefecture, temples 51 to 53 in Ehime Prefecture, and temples 66 to 69, 71 to 75, and 85 to 86 in Kagawa Prefecture. At Ryozenji, temple no. 1, wannabe pilgrims get decked out in traditional pilgrimage gear – a white vest, a pilgrim staff, and a sedge hat. This is not just for vanity reasons, however – wearing this gear allows for locals to recognize you as a pilgrim and offer you Osettai. These are gifts to pilgrims of food and drinks, which you should accept with gratitude. From temples 1 to 6, you walk on paved road through urbanized countryside whereas the trail from temple 11 to 12 is all in the mountains. A mysterious and larger-than-life bronze statue of Kukai will greet you deep in the forest where monk once practiced meditation. Temples 24 to 26 follow the dramatic coastline of Cape Muroto on the southern tip of Shikoku with sweeping views of the ocean. Temple 31 in Kochi City has superb gardens, and temple 51 in Dogo Onsen features many Buddhist statues with an artistic take of the head monk. Temple 66 is set on top of a 950m mountain, one of the highest elevations on the pilgrimage. You can marvel at the sight of 500 stone figures of Rakan, the disciples of the Buddha. Each one looks different, and if you step amongst them, you get the strange sensation that they are alive. At temple 71, Buddhist statues and images carved in rock line the steep flight of stairs uphill through the forest. Temple 85, also atop a mountain, has a panoramic view over the surrounding land. To find your way, you follow the “little red pilgrim,” a common trail marker, as well as the “pointing finger,” an old stone trail marker. Signage in English, except for road signs, is few and far between. The main motto of the pilgrimage is ‘dogyo ninin’ (‘we walk together’). Kobo Daishi, represented by the staff which pilgrims handle with utmost care, is always with you! 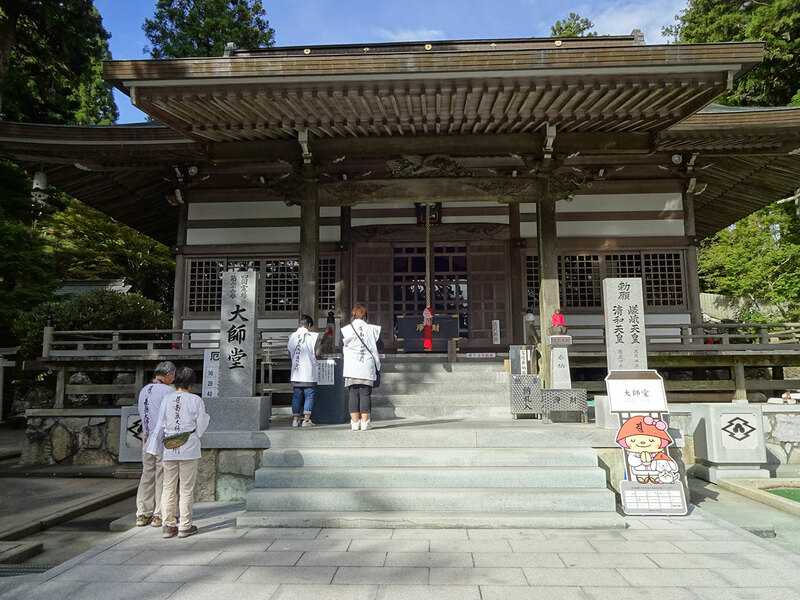 At each temple pilgrims visit, the Main Hall is the first stop to worship the main deity of the temple, followed by the Daishi Hall to pray to Kobo Daishi. There is a set of prayers that pilgrims recite, including a short mantra and the hannya shingyo, or heart sutra. Don’t feel bad if you don’t know it by heart; even many Japanese pilgrims need to read them from a book. Pilgrims can choose from different types of accommodations. Stay at a shukubo (temple lodging) or minshuku (pension) in the countryside where dinner and breakfast are included. In the cities, you can sleep at cheap business hotels and find food at nearby supermarkets and restaurants. Convenience stores are your best friend for lunch on the go. Popular temple lodgings are at Anrakuji (temple no. 6) and Zentsuji (temple no. 75). The Buddhist prayer ceremonies at these temples are a feast for the senses and will be a highlight of your pilgrimage. March to May and October to November are recommended seasons for walking. The temperatures are comfortable, and there are scenic views of cherry blossoms, fresh greenery, and flowers in spring, and of colorful leaves in autumn. A pilgrimage is not your ordinary trip but rather a journey of spiritual significance. With each step and each prayer, you might get a little closer to finding your true self! Namu Daishi Henjo Kongo. Most pilgrims visit Mount Koya first before starting their Shikoku pilgrimage. You can make your way by train from Mount Koya to Wakayama Port where a ferry departs several times per day to Tokushima City. After completion of your pilgrimage, take the Marine Liner, an express train that connects Takamatsu City (the capital of Kagawa Prefecture) with Okayama City on Honshu Island via the Great Seto Bridge. For travel between major cities on Shikoku, the highway bus is recommended. JR train lines run around the island, and there are also several private rail operators. Your best guide is a booklet in English called Shikoku Japan 88 Route Guide. It contains comprehensive maps and detailed information on transport and phone numbers for accommodations near each temple. Alena Eckelmann is a German freelance journalist who lives in the Kumano area of Wakayama Prefecture.